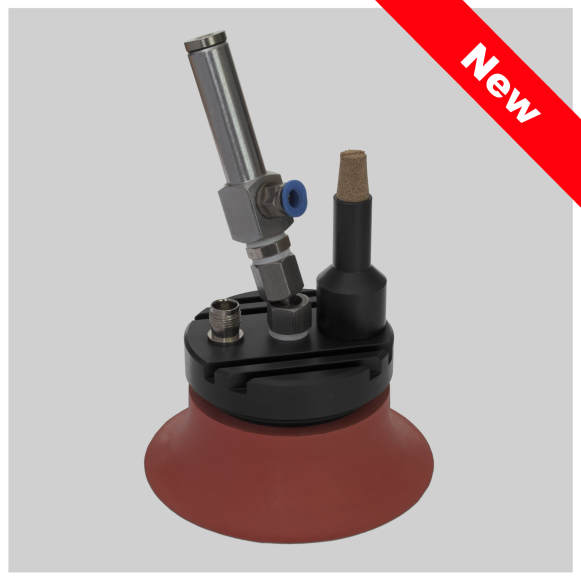 The Speckle Pattern Application Kit for the easy and fast production of a perfect speckle pattern for your DIC application! Why a good speckle patter is required? In DIC, a mesh of small subsets of the image are tracked as the specimen moves and deforms. To perform this tracking, the subsets are shifted until the pattern in the deformed image matches the reference image as closely as possible; this match is calculated by the total difference in grey levels at each point. A good pattern will allow the correlation to be made with high confidence and produce low noise. The example below shows the uncertainty for the out of plane measurement data in Z-direction with different speckle patterns. 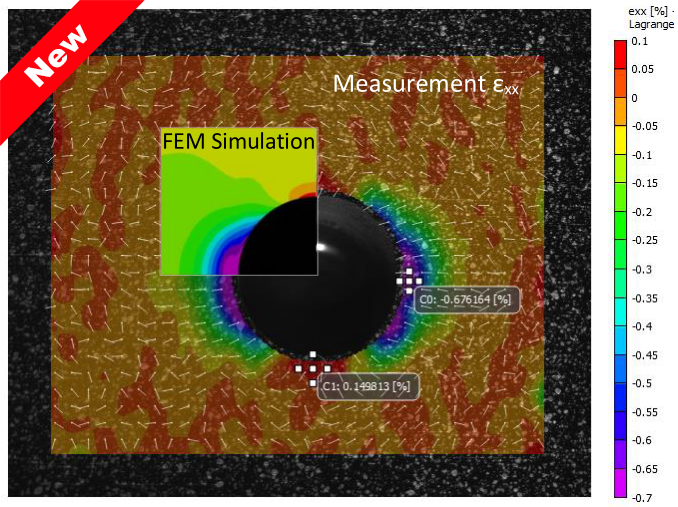 * recommended FOV (image width) for standard 5Mpx sensor with 2500x2000px. Alternatively check dot size, which should be minimum about 3x3px. 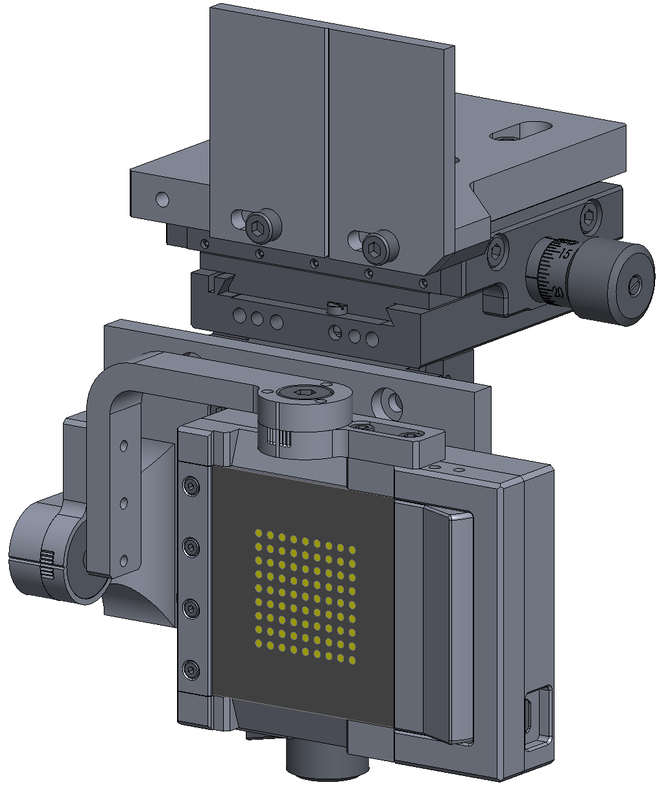 The major reason for applying light forming equipment in DIC is to avoid direct reflections. 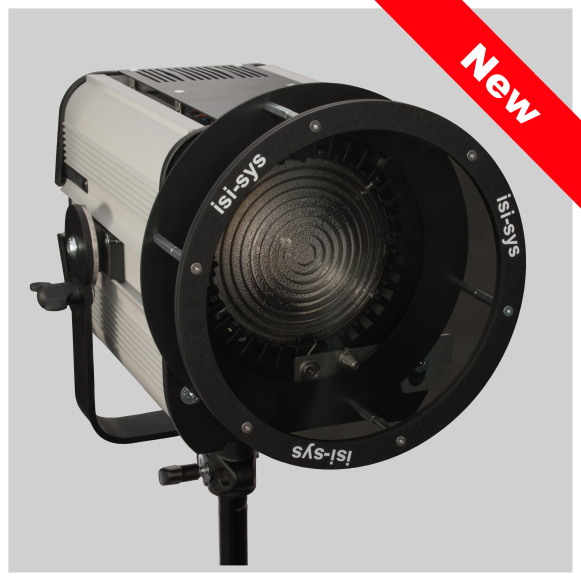 The HEDLER Profilux LEDs can be equipped with different light forming accessories such as usually applied in conventional photo studios. Some of them are also suitable for DIC. 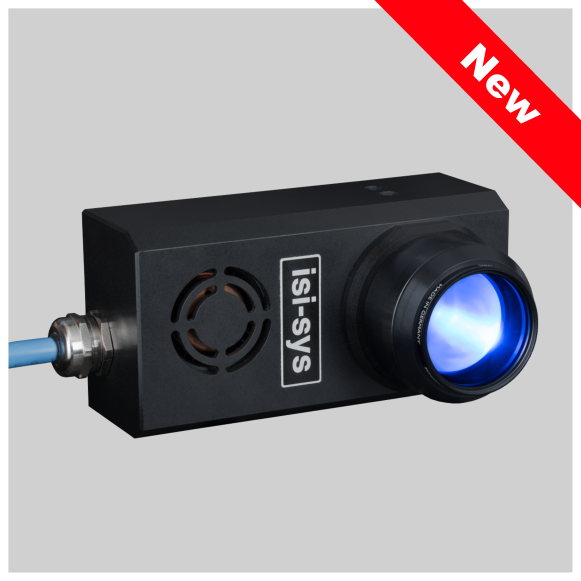 isi-sys can recommend suitable accessories for your application. 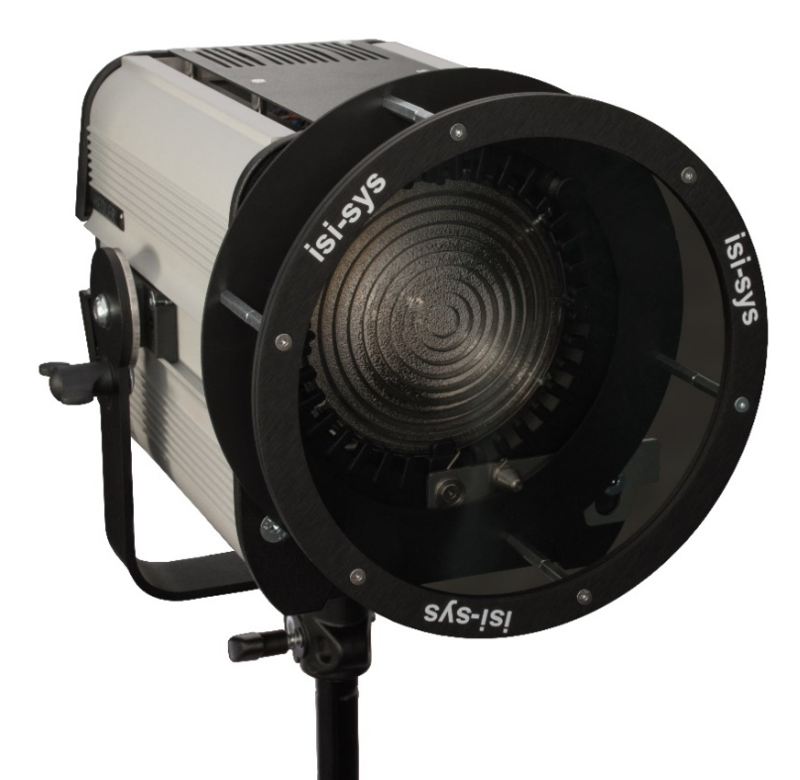 However the first basic recommendation is to set up the light source independently from the DIC system to adjust a suitable illumination direction. In a number of applications this is sufficient and these accessories can be avoided, which is of advantage, because their application is combined with light losses. 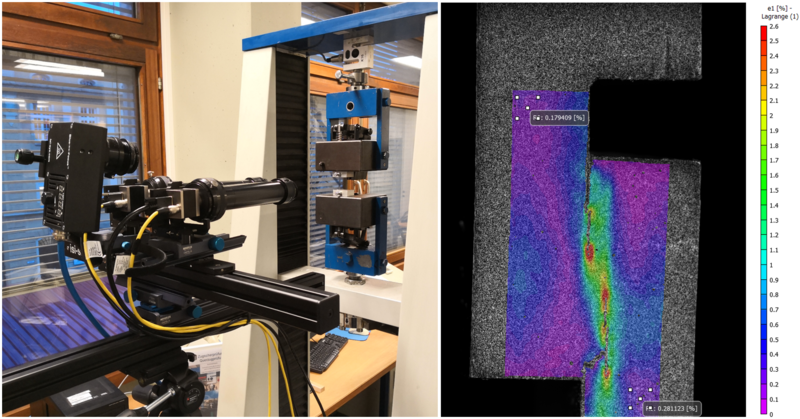 The short, single wave length (blue) improves the optical transfer function properties especially a) at the image boarders for conventional lenses and b) for high resolution, small FOV set-ups such as the Micro 3D stereo sensor. Power: Standard operation with 80W in continuous mode or 120W for pulse mode depending on duty cycle. Example for 0,7 duty cycle: 105W @ 240Hz and 2,9ms flash period. 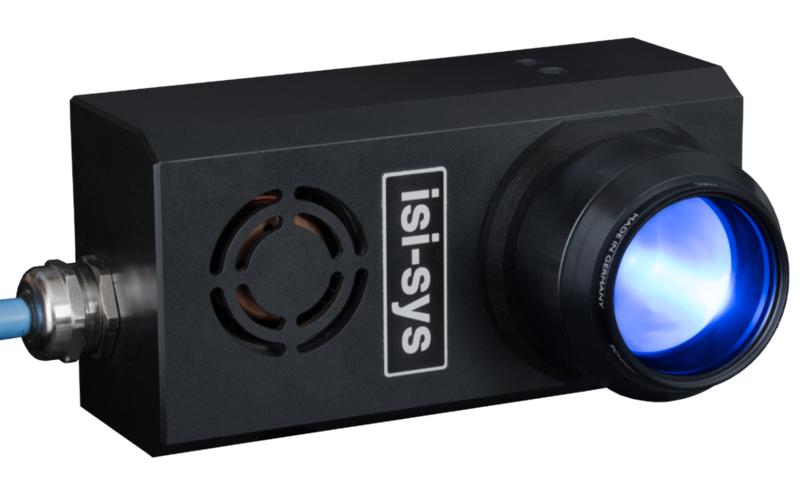 Power adjustable manually or external by pulse length and frequency as well as automatically limited depending on temperature. The cooling air stream is directed from the front inlet to the backside to avoid hot air waves in the images.Power: Standard operation with 80W in continuous mode or 120W for pulse mode depending on duty cycle. Example for 0,7 duty cycle: 105W @ 240Hz and 2,9ms flash period. 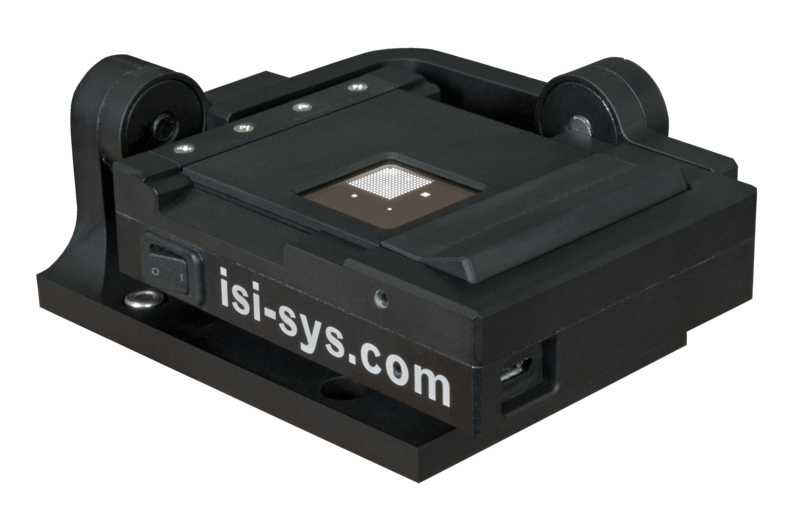 The isi-sys DAQ devices are set up for operation with the Vic software for Digital Image Correlation (DIC) by Correlated Solutions and function as integral part of isi-sys turn-key DIC systems. 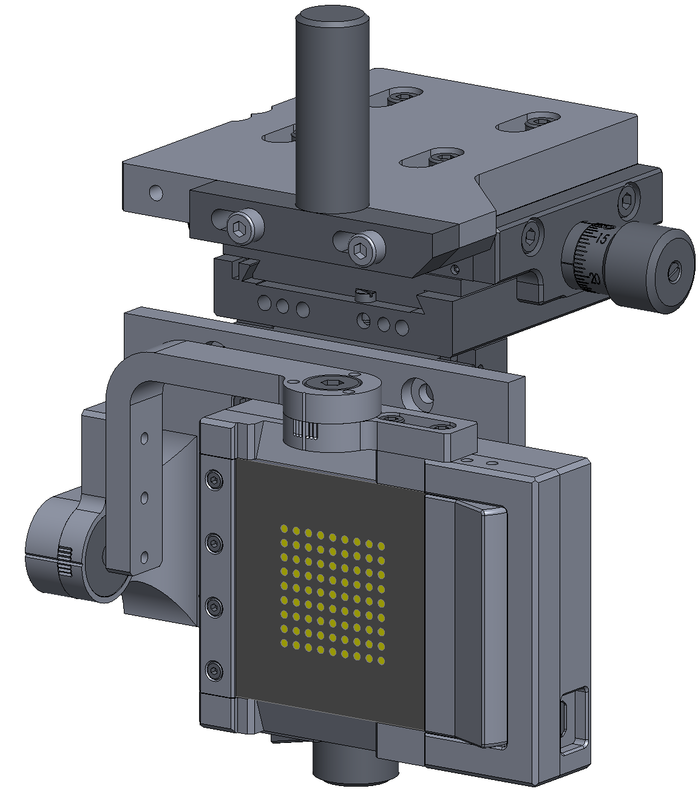 They mainly serve for triggering the cameras (hardware trigger) and simultaneously recording analog data as well as for delivering analogue real-time output generated by the Vic-Gauge software. Isi-sys also offers a 16-bit device – the DAQ-T8D-16. Both devices have +/-10V output channels. 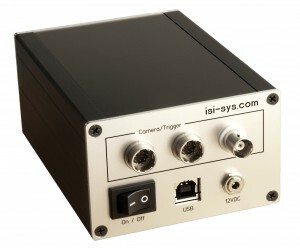 Hardware triggering and the power supply for the cameras are transmitted via the 12-pin Hirose connectors on the DAQ device. Two of these connectors are available for connecting up to two cameras. 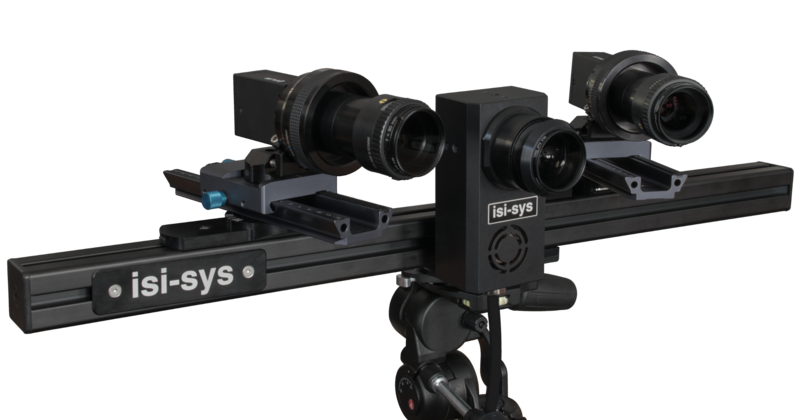 Isi-sys also offers Y-cables for operating 4 cameras (two stereo systems) or more. 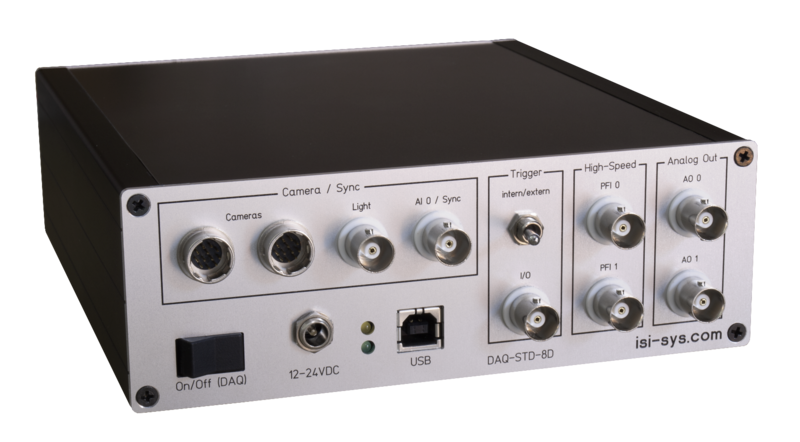 It is also possible to operate more than two cameras with one DAQ device. We will be happy to advise you. Connection to a computer is done by USB cable (type A <-> type B connector). 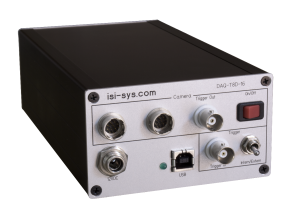 isi-sys DAQ devices are available with either differential or non-differential analog inputs. The analog input connectors are BNC type, the range is +/-10V. 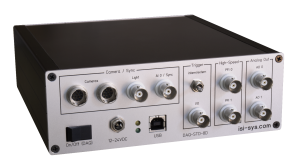 Besides analog inputs, all isi-sys DAQ devices can also be equipped with analog outputs (BNC type connector), which differ in voltage range depending on DAQ type. Digital IO connectors (BNC type) are available as well.